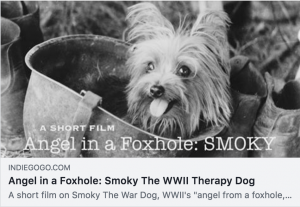 Ant Press author Jacky Donovan was so smitten by the heroic antics of Smoky, a tiny Yorkie Terrier found by an American soldier in Papua New Guinea during World War II, that she felt compelled to write her story, “Smoky: How a Tiny Yorkshire Terrier Became a World War II American Army Hero, Therapy Dog and Hollywood Star“. Soon Smoky’s incredible lifestory will be portrayed in the forthcoming film “Angel in a Foxhole: Smoky the WWII Therapy Dog”. We can’t wait to see it! You’ll find Smoky’s story on Amazon.